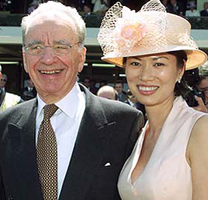 Wendi Murdoch (née Deng) is a Chinese born American businesswoman, and wife of News Corporation Chairman and CEO Rupert Murdoch. Deng was born and raised in Xuzhou, Jiangsu. She attended the local Xuzhou No. 1 Middle School. During high school, Deng's father relocated to Guangzhou to work at the People's Machinery Works, whilst Deng remained behind for a short while. Afterwards Deng joined her father in Guangzhou, and began medical studies. In 1987, at the age of 18, she met Jake Cherry, an American working for Guangzhou Engineering Factory, and his wife Joyce, who started teaching Deng English. In 1988 Mr and Mrs Cherry sponsored a student visa for Deng and she moved to America to live with the Cherrys and to study at California State University. In their November 1, 2000 edition, the Wall Street Journal published an article in which claims were made about Deng's personal history. The authors claimed that, in 1990, Jake Cherry left his wife to marry Deng after his wife found photos her husband had taken of Deng in a Guangzhou hotel room. Four months through their marriage, the article said, Jake Cherry asked Deng to leave when he found out she had been seeing another man. Subsequently, several other news outlets carried or made reference to the Wall Street Journal article. The Murdochs have denounced these rumours as "malicious nonsense." Cherry and Deng divorced after two years and seven months of marriage. Deng went on to apply to and be accepted by Yale University, where she received an MBA. Deng has recently become a director and chief strategist for the holding company that licences the MySpace brand and technology to MySpace China, her first formal involvement in the media business since she left her job as a Vice President of News Corporation's STAR TV in Hong Kong in the late 1990s. 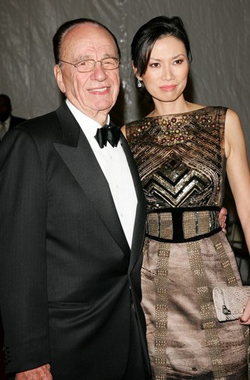 She married Rupert Murdoch on 1999. The couple have two children, Grace and Chloe, and live in Manhattan.